Dark Shadows is a home haunt that has been running since 2000! 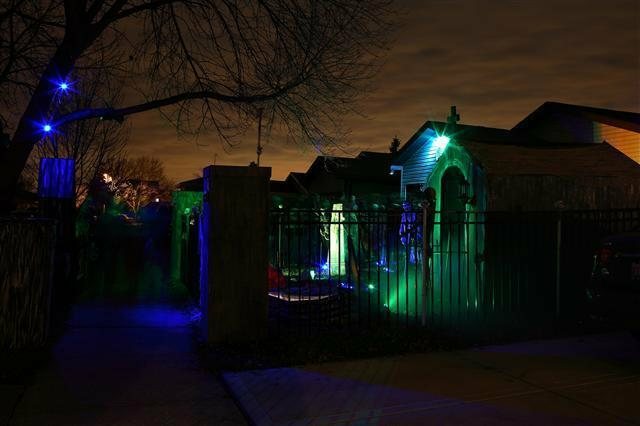 Every year getting bigger and better, we have a full animated cemetery as our yard display with over 15 animated props. In 2005 we expanded and opened a walkthrough that changes every year. Mike Yazumbek is the mastermind behind all of this, who fabricates every prop by hand and sets up the whole display. We try to keep it as a theme, where the front is set up to an an acient cemetery, that was taken over by zombies and skeletons. Throughout our walkthrough you will take a stroll thru a forest, dungeon and a clown room. Live actors most nights along with our hollywood like effects and animatronics make us a must see! DS Has won many awards over the years and has been winning the Orland Hills Decorating contest 1st place for the past 8 years. In 2011, DS Ranked in the top 20 haunts in world by the Home Haunters Association. Some of our custom props and animatronics can be seen at the Reapers Realm Haunted Attraction located in Indiana, Midnight Terror Haunted House in Oak Lawn, The Massacre Haunted House in Montgomery, and also the Crete haunted house in Crete.. Best of all, Dark Shadows is FREE! Come out check us out!